Josh Smith’s shooting has reached it’s low point, or has it? Three months ago I dedicated a post to Josh Smith’s shot selection, back when it wasn’t so rough on the eyes. The newly-signed Pistons forward hoisted 23 threes through the first three games of the season but the mid-range attempts were mostly absent. A long shot to be an above-average shooter, having Smith take a step behind the line instead of taking 20-foot two-pointers was a step in the right direction, one that would yield more points per attempt from jump shots he’d have to take when playing alongside Greg Monroe and Andre Drummond. It was a hopeful sign of efficiency. Smith’s just 16-for-87 beyond the arc (18.4 percent) over his last 30 games. SportVU lists him as the worst three-point shooter in catch-and-shoot situations (24.7 percent) among the top 100 players in attempts, with teammate Charlie Villanueva second to last. His percentages are even worse in pull up attempts, though those shots have rarely occurred and it’s common for players to struggle shooting off the dribble versus a pass. The three-point rates in December and January match up with Smith’s last season in Atlanta. Maybe they have to do with Detroit’s big three of Smith, Drummond, and Monroe playing together less frequently each month. According to NBA.com, the trio was together 18.7 minutes in November, 16.2 in December, and 15.0 in January. Neither monthly split yielded positive results, though that’s not 100 percent on Smith. The trio needs to be severely staggered, and Brandon Jennings at point guard hasn’t helped any. The other evil in Smith’s game is the mid-range shot. The heater from that area of the floor last month, one that gave him a nice uptick in true shooting percentage was obvious, possibly even fatal fool’s gold after last night’s performance in Miami. Smith’s never shot better than 39 percent from mid-range in a single season, and there’s a chance if the three-point line was shortened like it was from 1995 to 1997 that he’d likely experience little to no improvement like players listed here. As disappointing as Smith’s shooting has been, he’s not the sole reason for Detroit sitting in ninth place behind Charlotte and Washington. His shooting is costly but he would have more to offer if he wasn’t playing small forward over half the time, a position that helps neglect the skills he provides on both offense and defense. 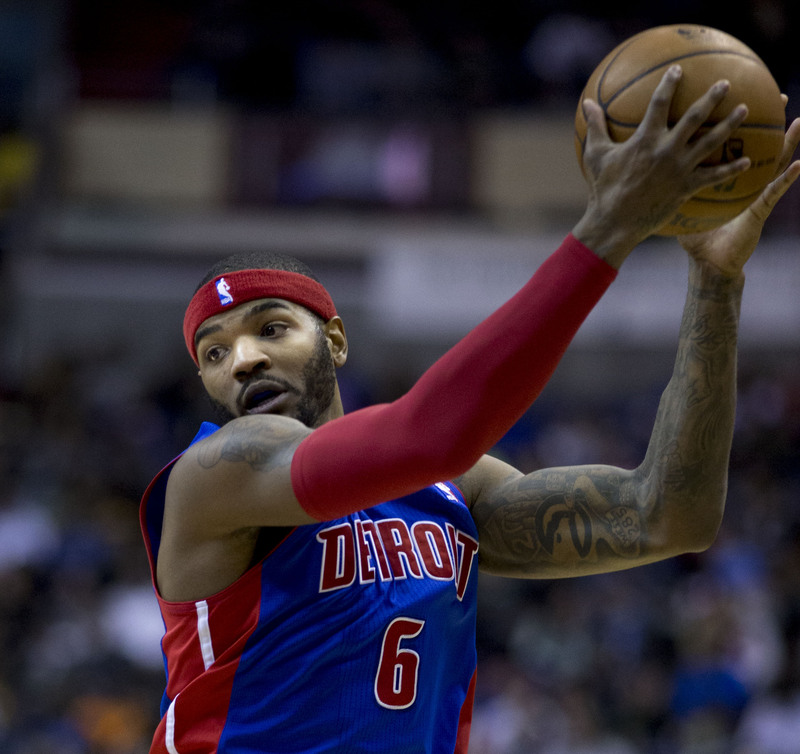 The Pistons, however, are going nowhere unless a third of its frontline is shipped out. Trading Smith would be impressive when he’s on the books until 2017 at $13.5 million a pop, but Monroe seems like the most moveable piece given his looming, steep raise next summer, one possibly not worth it given the holes in his defense. Then again, the same could’ve been said about Smith’s contract and whether or not it’s worth paying him to play on the perimeter. Joe Dumars must’ve thought it was but the results, at least on offense, have been a three-month migraine. There’s plenty of room for improvement in Smith’s shooting with some of it bound to happen given how bad things have become, but the slight possibility that the worst-case scenario remains to be seen is amazing in itself.